Sci-Fi November might be over, but that doesn’t mean the sci-fi fun has to stop. 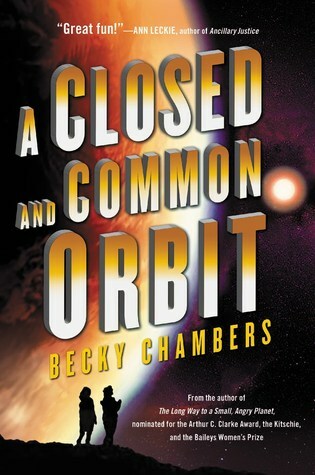 Our Read-Along of A Closed and Common Orbit by Becky Chambers has officially begun. If you’re interested in participating, hop on over to the SF/F Read-Along group for more information; we’d love for you to join the discussion. Have you read The Long Way to A Small Angry Planet, the first Wayfarers book? Are you planning on reading this standalone follow-up? Let us know your thoughts. 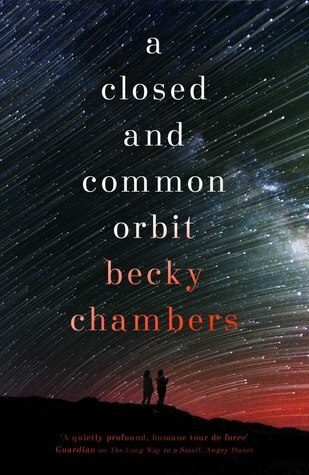 A Closed and Common Orbit is the stand-alone sequel to Becky Chambers’ beloved debut novel The Long Way to a Small, Angry Planet and is perfect for fans of Firefly, Joss Whedon, Mass Effectand Star Wars. You know, I actually think I prefer this. As much as I enjoyed the large ensemble cast of A Long Way to A Small Angry Planet, there is something to be said about having a more intimate connection with only one or two characters in a story; I tend to do better with books like these. I might miss the characters from book one themselves, but not so much the format. I am pretty comfortable with how things are going so far with just Lovelace/Sidra and Pepper/Jane 23. So many examples! A few that stood out for me were the times we got to learn how Sidra’s body kit was fitted out, discovering all kinds of “features” its creators had programmed in. Sidra having her first experience with the warm drink and getting the “associated imagery” of the lounging cat was pretty hilarious. There was also the part where she called up the steps to “make herself comfortable.” Now wouldn’t it be nice if everyone in the world followed such careful protocols for, say, etiquette? The things she learned at the party were pretty interesting too, but to be honest, as the reader I probably felt just as overwhelmed and awestruck about the world as our protagonist did. Hard to say, since we’re still so early in the book. Jane 23’s story is slowly emerging at this point, but it’s pretty clear to me already that this Pepper in the past. I’m a little confused about where her storyline is going right now, only because everything in her world is still so new and alien and bizarre to me, but I’m interested to see where this is going. I would say Sidra’s POV is more engaging at the moment simply because I know more about her, but this could rapidly change as the plot develops further in the Jane 23 chapters. I believe I’ve already discussed a few of my favorite scenes in my answers above, but in general I find I’m really enjoying the relationship dynamics between Sidra and Pepper. As for curious questions, I did get a random thought about whether we might get to see any of the old cast again, even if it’s just a brief cameo or two. But since A Closed and Common Orbit has been touted as a “standalone” sequel/companion novel, I doubt it. I mean, it would be nice if it happened, but I definitely won’t hold my breath. Gah, just put up my own review for this one! Fabulous coincidence. I’m so glad to see this series getting so much love – I think it’s so deserving. Who needs sad Hugo puppies when we have such awesome subversive sci-fi?! I’m enjoying this one so far although I have no idea where it’s going! I really like reading about Jane 23 – it’s quite a fascinating storyline. Me too! So intriguing, I wonder where it will go!